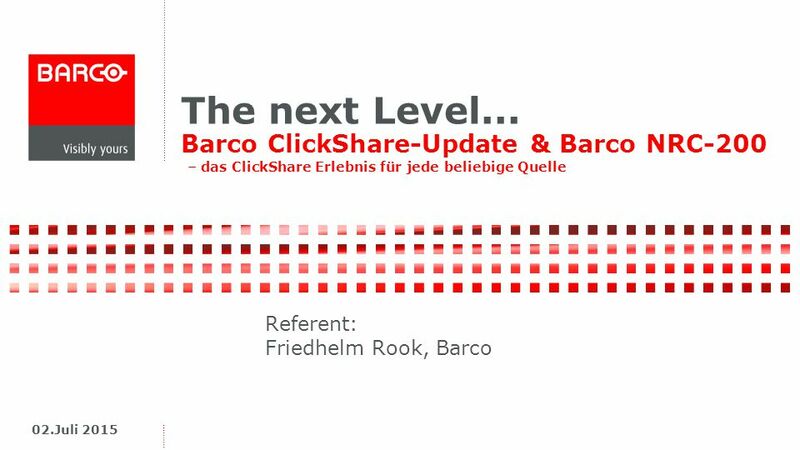 The next Level... Barco ClickShare-Update & Barco NRC-200 – das ClickShare Erlebnis für jede beliebige Quelle Referent: Friedhelm Rook, Barco 02.Juli. 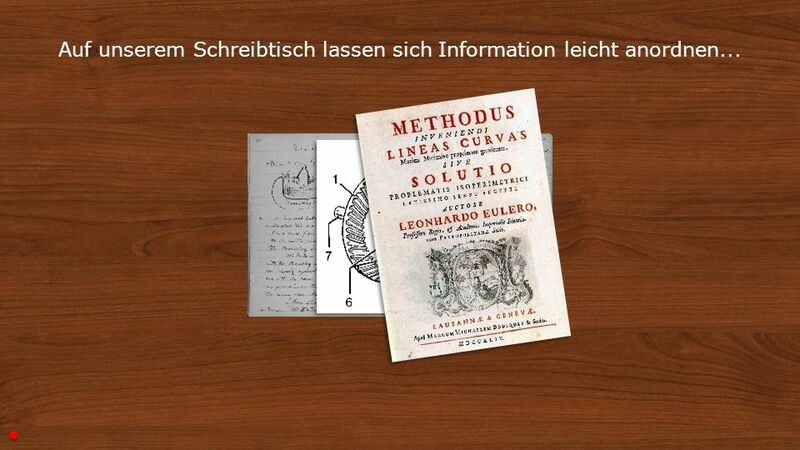 Wouldn’t it be nice if you could work with digital sources in a classroom or meeting room just like you work with documents and books at an office desk? 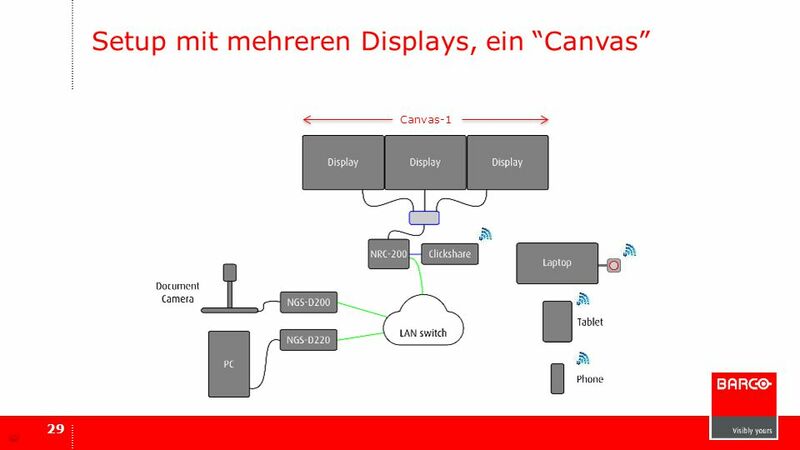 You open a book, put it aside to add some more information… Arranging digital sources on a display is not as easy as arranging informtion on your desk. 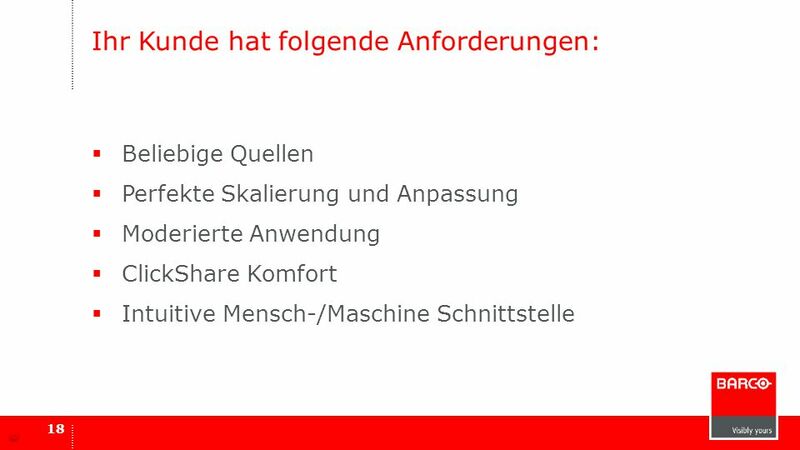 …in der digitalen Welt sind die Dinge nicht so einfach. 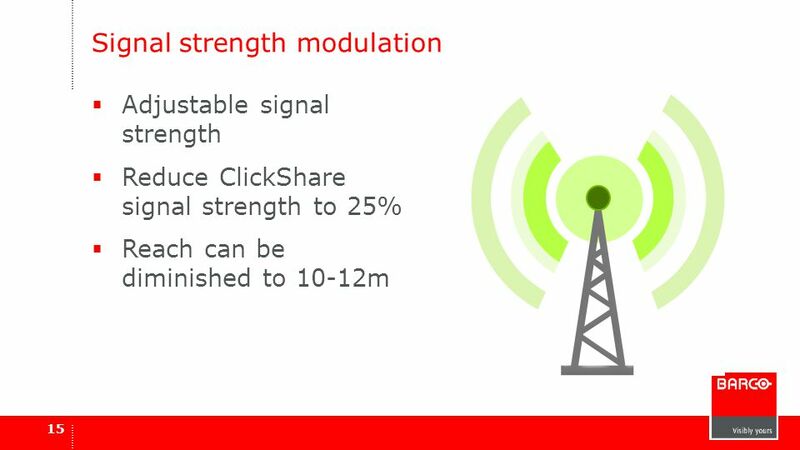 looking for signal... 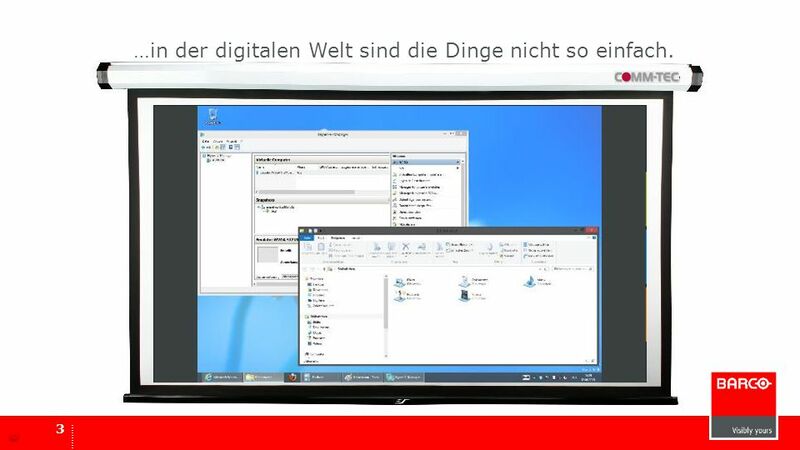 In our digital world, things are not that simple It takes effort to bring a PC dekstop onto the display And now you want to bring in an extra laptop with other information You can only switch from one source to another, how can you see multiple sources of information next to another? 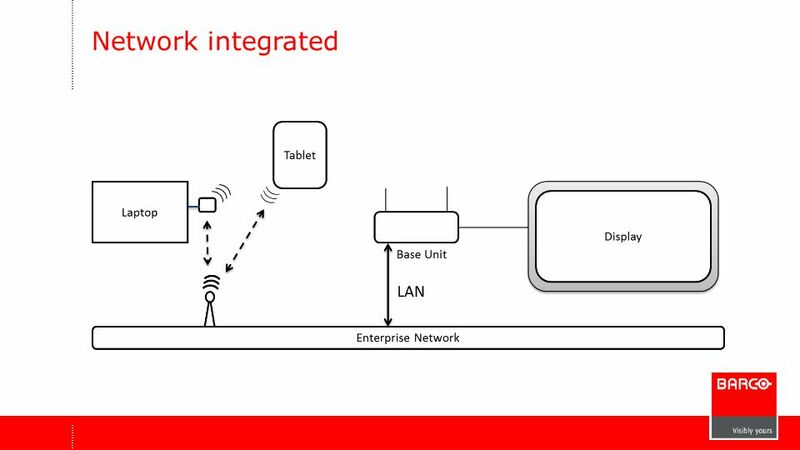 And what if the info resides on a phone or tablet? 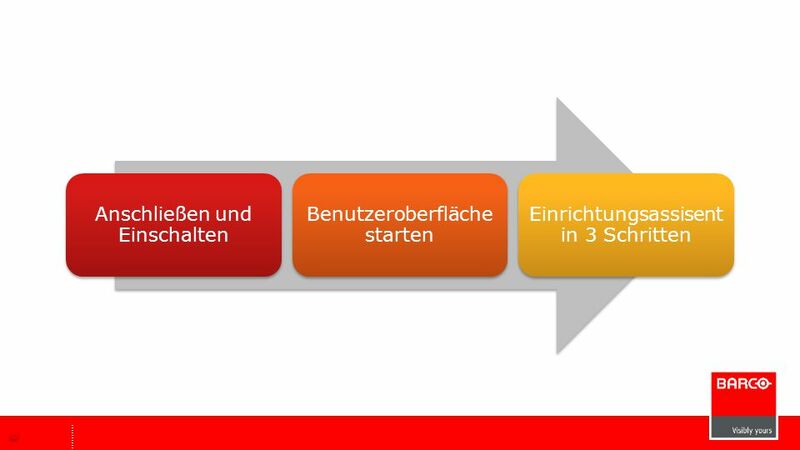 How to get it next to all the other information for everyone to see? 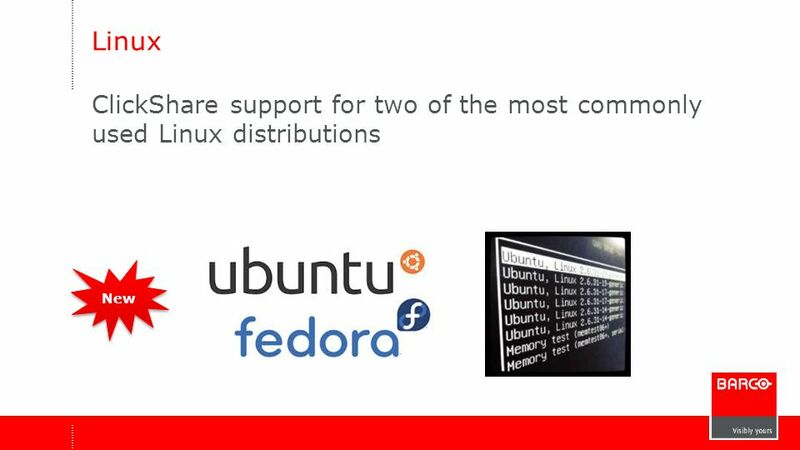 7 Fedora 20 en Ubuntu 14.04 LTS zijn de officieel ondersteunde distros. 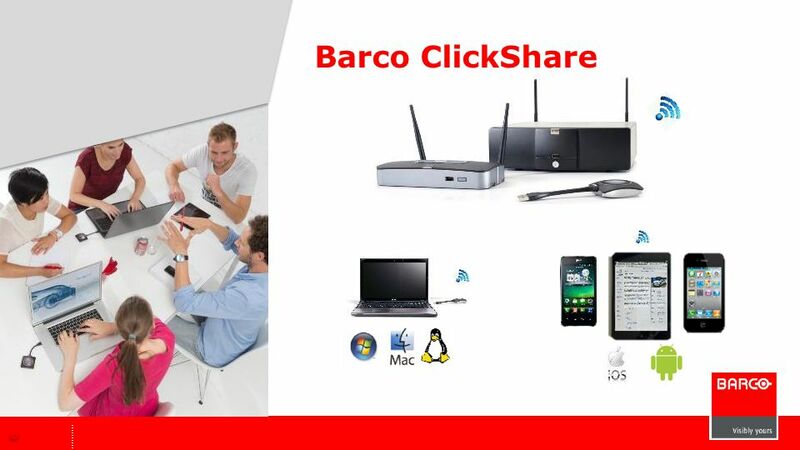 Linux ClickShare support for two of the most commonly used Linux distributions New Fedora 20 en Ubuntu LTS zijn de officieel ondersteunde distros. 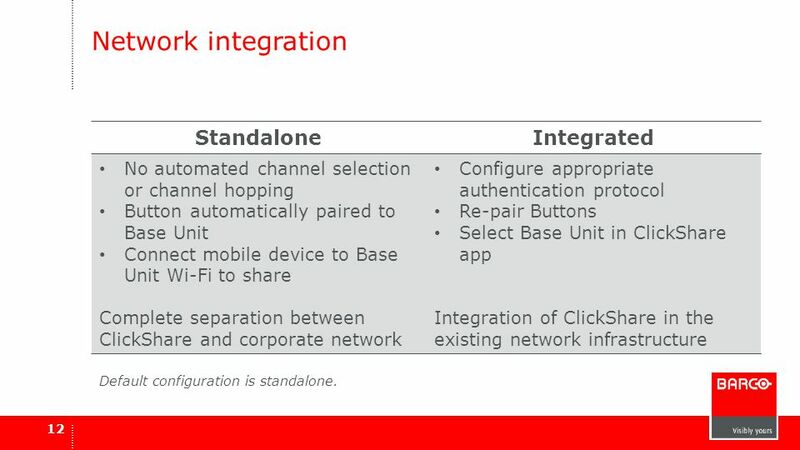 No automated channel selection or channel hopping Button automatically paired to Base Unit Connect mobile device to Base Unit Wi-Fi to share Complete separation between ClickShare and corporate network Configure appropriate authentication protocol Re-pair Buttons Select Base Unit in ClickShare app Integration of ClickShare in the existing network infrastructure Default configuration is standalone. 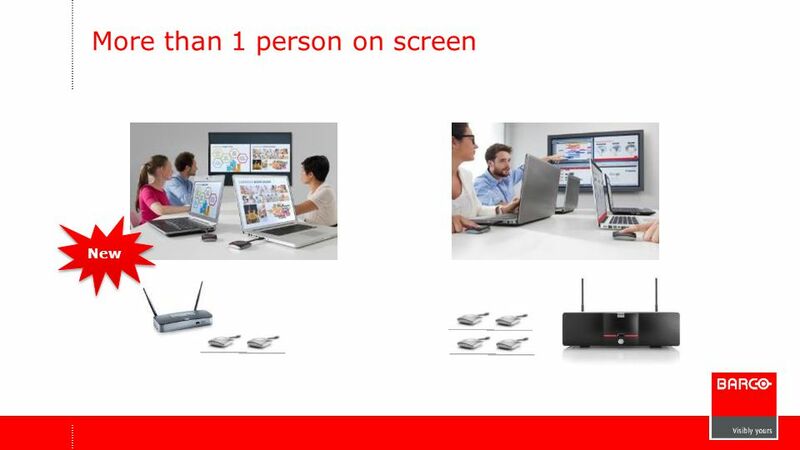 v1.6 or higher v1.3 or higher For optimal performance, it is important that the firmware on the ClickShare Buttons matches the firmware on the Base Unit. 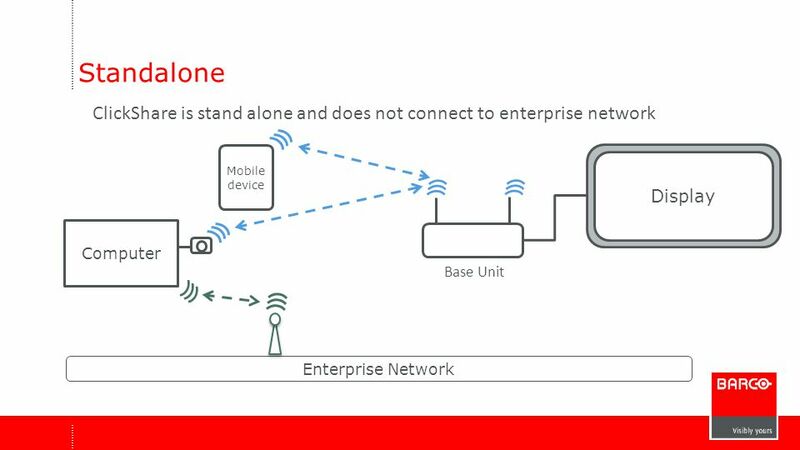 When the firmware version of the Base Unit is more recent than the firmware version of the Button, the Button will be updated automatically over Wi-Fi. The update does not require any action from the user. 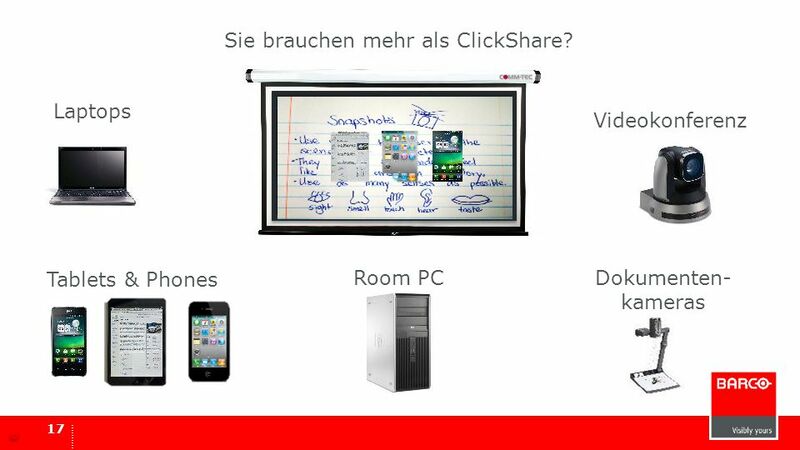 17 Sie brauchen mehr als ClickShare? 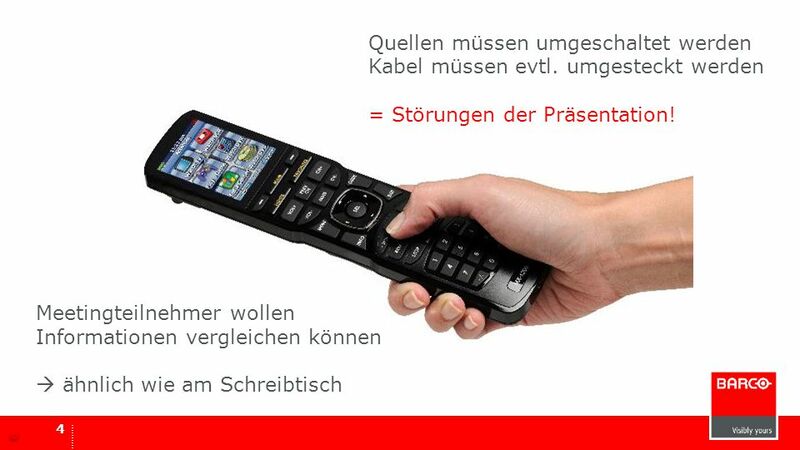 Beliebige Quellen Perfekte Skalierung und Anpassung Moderierte Anwendung ClickShare Komfort Intuitive Mensch-/Maschine Schnittstelle Geht das? 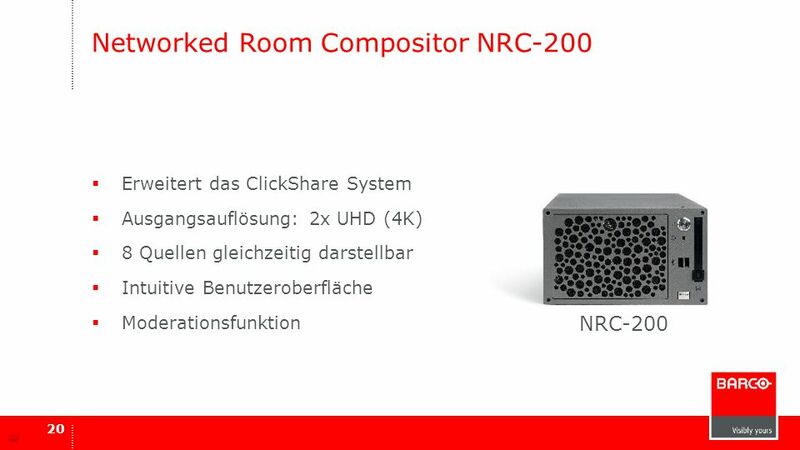 Erweitert das ClickShare System Ausgangsauflösung: 2x UHD (4K) 8 Quellen gleichzeitig darstellbar Intuitive Benutzeroberfläche Moderationsfunktion NRC-200 Introducing the Room Compositor (NRC-200) The compositor extends Barco Clickshare capabilities by allowing all sources in a room to be displayed. 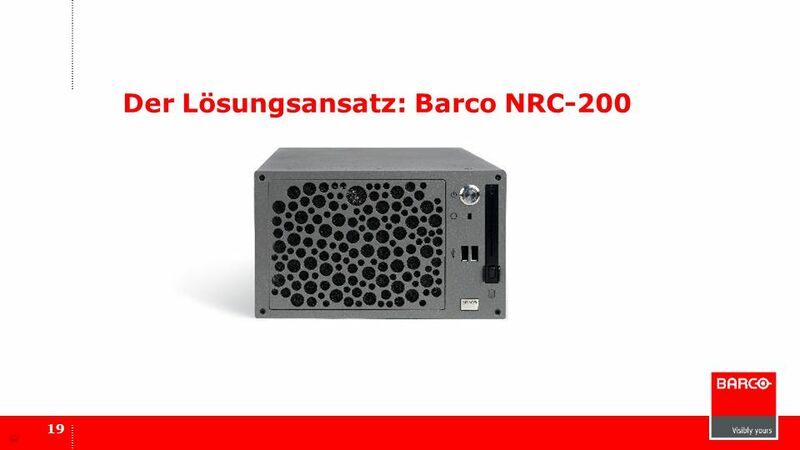 The NRC-200 drives up to 2 UHD displays which can be used indepently if required. 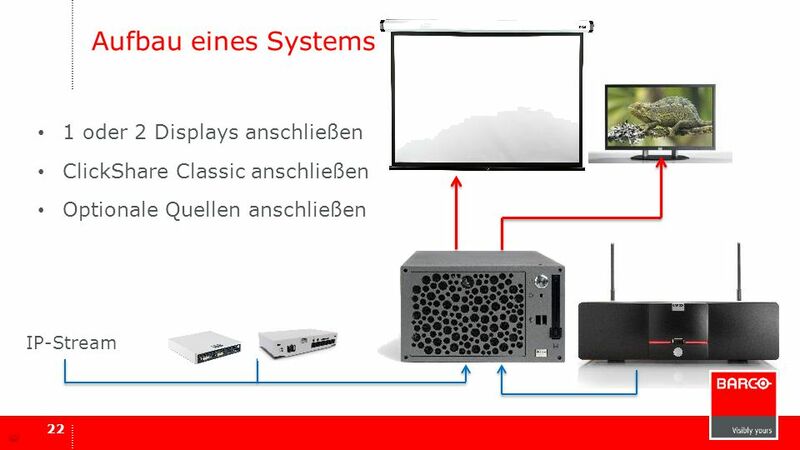 Up to 8 HD sources can be shown at the same time, enabling the most active collaboration between all participants in a classroom or meeting room. 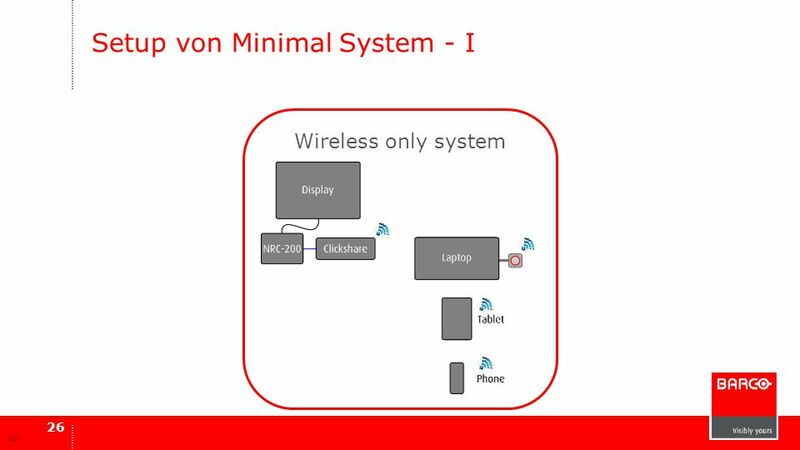 The simple interface allows anyone to use the system without training. 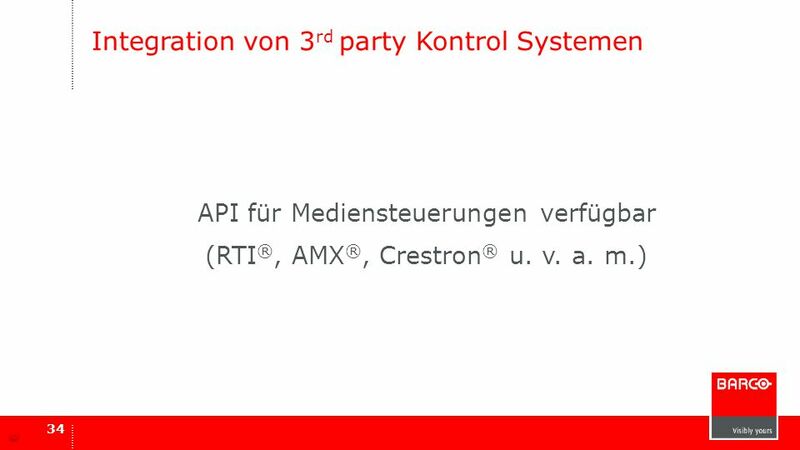 The default moderation function allows you to be in control at all times. 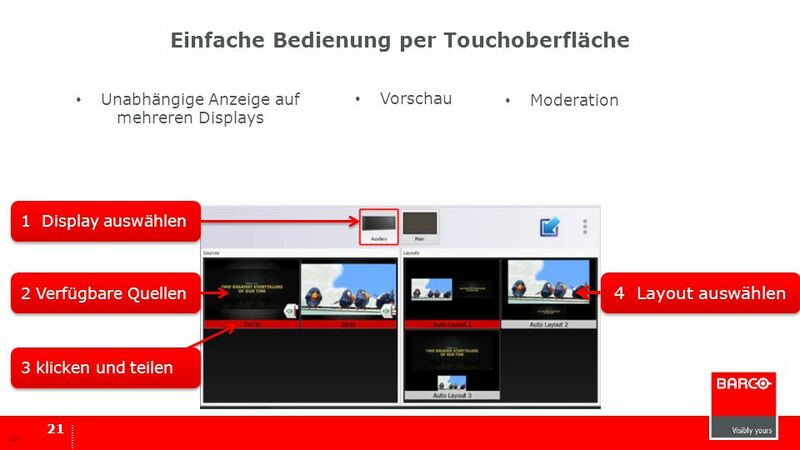 Unabhängige Anzeige auf mehreren Displays Vorschau Moderation 1 Display auswählen 2 Verfügbare Quellen 4 Layout auswählen 3 klicken und teilen Through a simple touch application it is possible to control not one but two displays at the same time. 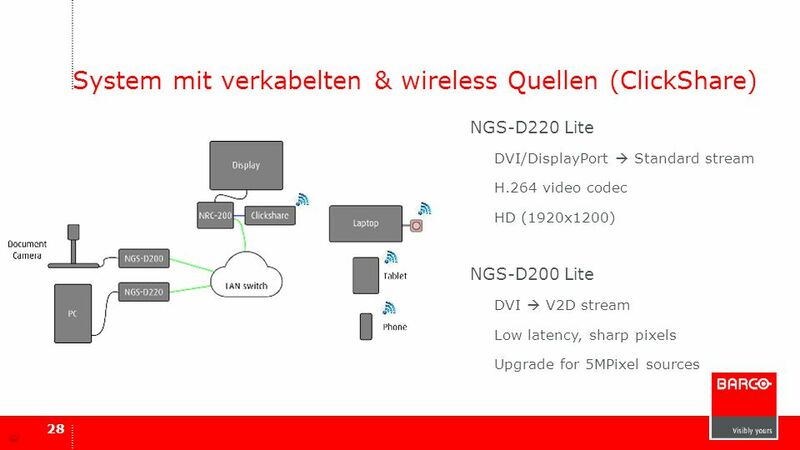 You can use the second display output as confidence monitor or as an extra canvas to have more room to put information on. 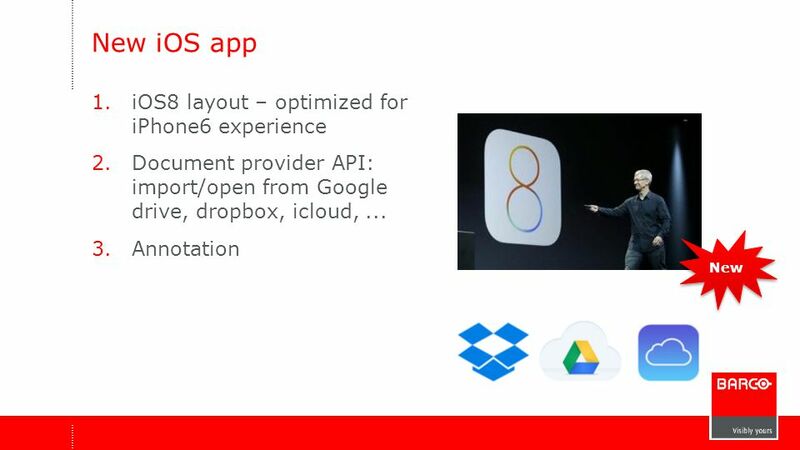 The application shows you all available sources with preview, this makes it easy to select what you need Just click the preview to show the source on the selected screen. 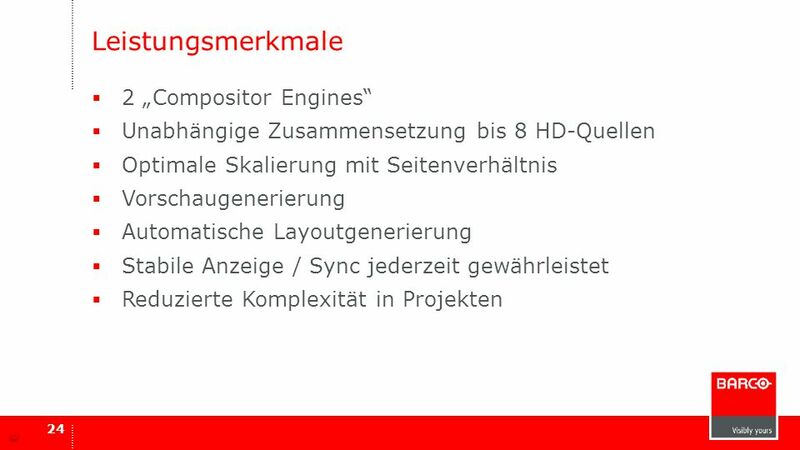 The system handles the automatically arranged sources, but offers alternative views on the right side of the interface. 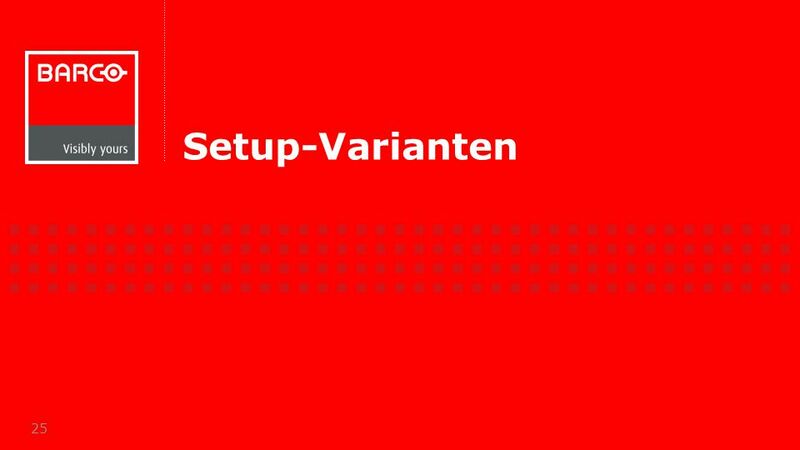 This allows you do easily re-arrange sources with one button click. 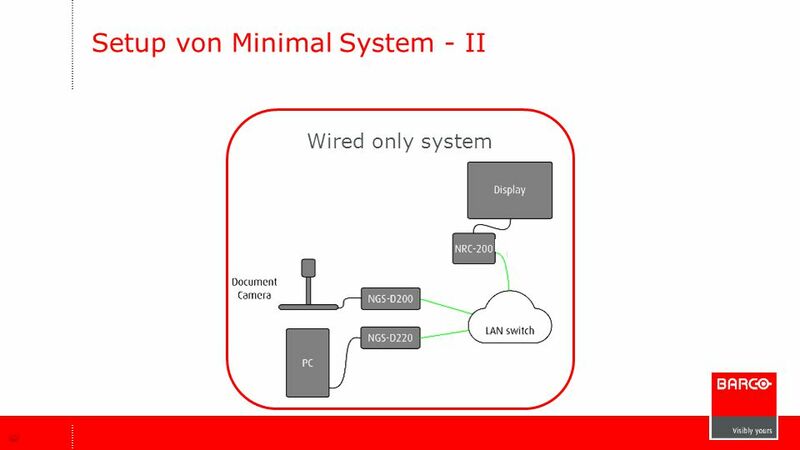 The presenter is in full control as the system comes default with a moderation function enabled. 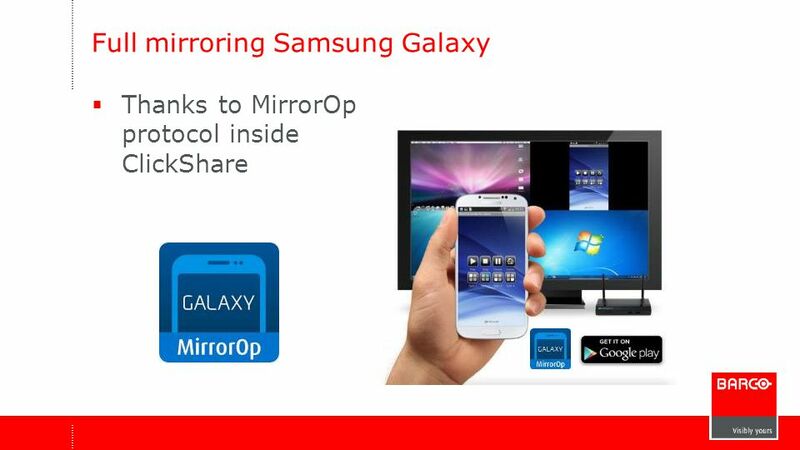 Your participants cannot push information to the screen without your consent. 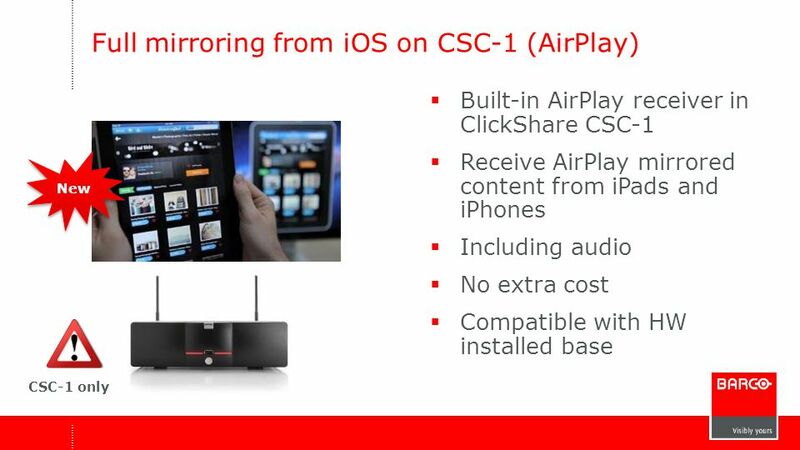 1 oder 2 Displays anschließen ClickShare Classic anschließen Optionale Quellen anschließen IP-Stream Building a system is very easy Connect your displays to the NRC- 200 Add a Clickshare CSC for wireless presentation capabilities Now you can already show up to 8 Macs, Pcs, Android and iOS phones and tablets together on the displays For wired or fixed installed sources likes room PCs and Visualizers 2 different capture devices send pixel perfect high resolution content over the local network to the NRC-200 You can add as many capture devices as required to the system. 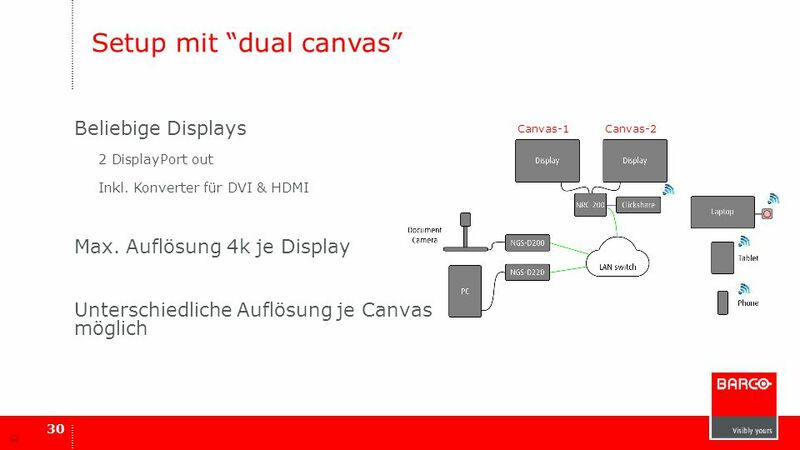 Single Display Anwendungsbeispiele Dual Display One canvas Dual canvas Main + Confidence/Preview You can use the NRC-200 with a single display from huddle rooms up to big auditoria Or you can drive two displays. 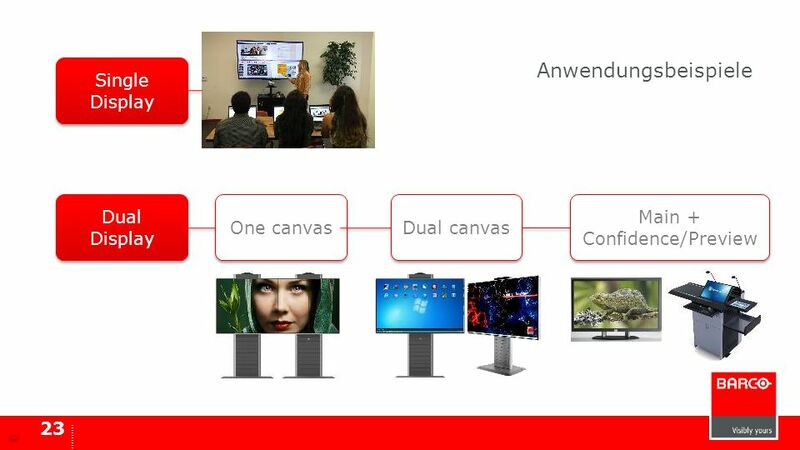 These two displays can be set up to form a single display canvas Alternatively the two displays can be used separately to put different content on each screen. 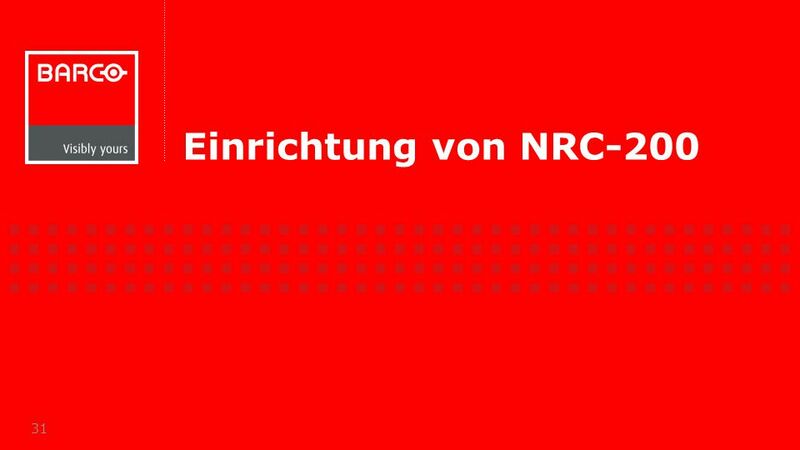 Finally, the NRC-200 supports a presentation scenario where a main display is combined with a confidence monitor. 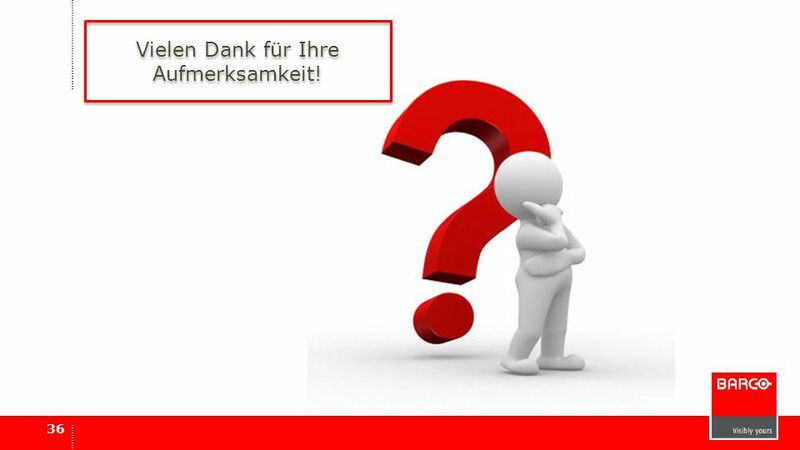 36 Vielen Dank für Ihre Aufmerksamkeit! 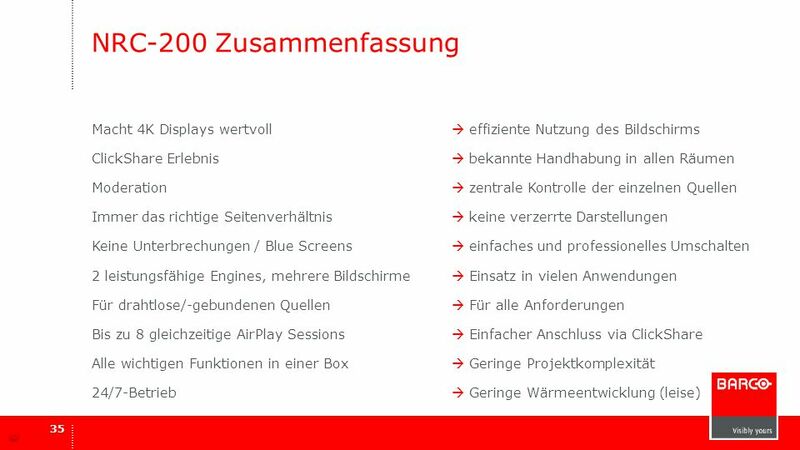 Herunterladen ppt "The next Level... Barco ClickShare-Update & Barco NRC-200 – das ClickShare Erlebnis für jede beliebige Quelle Referent: Friedhelm Rook, Barco 02.Juli."